ONLY 6 seats remaining. Buy soon! 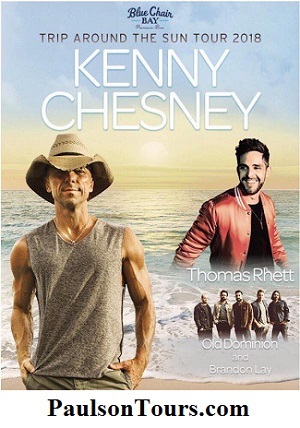 Join us for the Kenny Chesney: "Trip Around the Sun Tour" at Metlife Stadium featuring: Thomas Rhett, Old Dominion, and Brandon Lay! EXACT SEATING ~ KNOW BEFORE YOU GO! Have your own tickets? "RIDE ONLY" with Deluxe Tailgate is also available! THE BEST 6 HOUR Tailgate Party and Food including: Chicken Bites, Pork BBQ, Meatball Marinara, Baked Ziti, Garden Salad and Desserts. Groups of 10 or more Call. Call for Groups of 20 or more. Book online below or call us at (570) 706-TOUR.